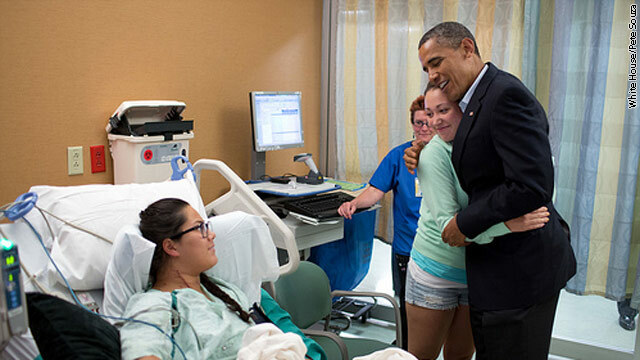 President Obama wakes up on Monday in San Francisco after a trip to visit the victims of Friday's mass shooting in Colorado was added to his schedule for Sunday. After meeting with victims and their families at University of Colorado Hospital in Aurora, Obama flew on to San Francisco where he will also overnight on Monday. He will travel to Reno to speak at the 113th National Convention of the Veterans of Foreign Wars at the Reno Sparks Convention Center. He'll then return to the Bay Area for some fundraisers. Heroes are often born out of tragedy. The young lady who saved her friend's life is certainly one. Kudos to the President for retelling her story! I'm certain there are many more stories like this one yet to be told from this tragedy! THERE WERE ALSO SOME SERVICE MEN AND FAMILY MEMBERS WHO DIED SHIELDING OTHERS. NOT ENOUGH CAN BE SAID TO PRAISE AND UNFORTUNATELY MOURN SUCH HEROISM. I THANK BOTH GOVERNOR ROMNEY AND PRESIDENT OBAMA FOR PULLING TOGETHER ON THIS FOR THE GOOD OF THE COUNTRY AND PUTTING POLITICS ASIDE EVEN FOR A SHORT WHILE. Well said and I am i agreement! This event happened to ALL of us. God Bless America and keep us working together so that, this will not happen again. Sorry for all those involved and those that had lives that were taken too soon. Over 250 young black people were killed in Chicago this year. Obama has not said a word. The loss of life is needless and sad. Chicgao has gun laws on te books and it does not work! The criminal element will always have access! Shortly after Kitrina NOLA police pulled guns from reistered owners. Why? Those were the names on the books.. Since criminals don't register, the NOLA cops had no idea what criminal had what. All they knew was who LEGALLY registered and owned guns and they were t efolks te copw went after! Chicago and DC have guns law! Yet both have exteremely high murder and gun crime rates! Again, the ONLY folks to be hurt by gun laws are those who legally own them! This is NOT political, just factual! SO LET ME GET THIS STRAIGHT, IN ORDER FOR THE PEOPLE OF CHICAGO TO STOP KILLING EACH OTHER WITH GUNS WE SHOULD LET THEM HAVE MORE GUNS? WHY HASN'T THE NRA CAMPAIGNED FOR THAT? OH YEAH, THEY DON'T CARE. THEY MANAGED TO GET RID OF THE ASSAULT RIFLE BAN SO THEY CAN'T BE BOTHERED. THAT'S THE REAL ISSUE HERE. NOT ENOUGH PEOPLE CARE SO THE LAWS ON THE BOOKS CAN BE ENFORCED PROPERLY AND WITH GREATER SUCCESS. I FIND IT SAD THAT PEOPLE WOULD LOOK AT THIS AS A FAILURE OF GUN CONTROL WHEN IT REALLY IS A FAILURE OF GOVERNMENT. WELL GUESS WHAT. WE ARE THE GOVERNMENT. WHEN THE RULE OF LAW FAILS, WE ALL FAIL. I ALSO BLAME OBAMA FOR NOT DOING ENOUGH FOR CHICAGO AND I WOULD NOT BE SHOCKED IF HE SUFFERS A POLITICAL SETBACK THERE. December, as I said several times, guns laws ONLY affects those who are legal owners. If there were less guns, who would be subject to less guns? Criminals? If that were the case government buy back projects should have almost emptied out the criminals by now! In my example of NOLA police, the only folks targeted were LEGAL owners! I already explained why! I also explained how DC and Chicago have certain laws on the books now! So why aren't the murder rates dropping? December 2012, you asked SO LET ME GET THIS STRAIGHT, IN ORDER FOR THE PEOPLE OF CHICAGO TO STOP KILLING EACH OTHER WITH GUNS WE SHOULD LET THEM HAVE MORE GUNS? Globally, MAD Mutually Assured Destruction. think cold war US and the then USSR! Locally, if a bad guy thinks "when I break into this house, I'm walking in but getting carried out with a sheet over me". that bad guy STILL coming in? LET ME PUT IT TO YOU THIS WAY, THE CITY OF CHIGAGO FACES AN UPHILL BATTLE BECAUSE GUNS CAN BE LEGALLY OBTAINED ELSEWHERE IN THE COUNTRY. NOT ONLY THAT, THE CURRENT LAW ON THE BOOKS IN CHICAGO IS ALREADY GETTING STRIPPED AWAY BY GUN RIGHTS LOBBYISTS. MY APOLOGIES TO THE NRA FOR SAYING THEY DON'T CARE ABOUT CHICAGO POLITICS. YOU HAVE NOT ANSWERED MY QUESTION. WHAT IS YOUR SOLUTION TO GETTING RID OF GUN VIOLENCE IN THE STREETS OF CHICAGO? YOU KEEP BRINGING UP NOLA SO FINE, WHAT DO YOU THINK THE POLICE SHOULD HAVE DONE TO PREVENT FURTHER GUN VIOLENCE IN THAT CRISIS SITUATION? DO YOU REALLY BELIEVE THEY JUST TARGETED ONLY THE LEGAL OWNERS? IF YOU WANT TO BRING UP GUN CONTROL FINE, BRING UP GUN CONTROL. SINCE WHEN IT IS ACCEPTABLE TO LEGALLY OWN ASSAULT WEAPONS AS WE DO NOW? THIS IS NOT MY QUESTION BY THE WAY. THIS IS A QUESTION COMING FROM ONE OF THE PARENTS OF A VICTIM OF THE COLUMBINE MASSACRE. WHERE DO WE DRAW THE LINE HERE? NOBODY IS ARGUING WE HAVE THE RIGHT TO BEAR ARMS, BUT WHERE DOES IT END? WHEN EVERYONE IS ARMED TO THE TEETH? RPGS FOR SALE AT YOUR LOCAL GAMESTOP? IS THIS REALLY A SOLUTION OR WISHFUL THINKING? WE HAD A DOOMSDAY CLOCK FOR A GOOD REASON. WE GOT LUCKY AND HAVE BEEN ON THE PATH TO DISARMAMENT SINCE. AND IF WE SHOULD SERIOUSLY BASE OUR POLICIES ON WHAT A CRIMINAL WOULD BE THINKING WHEN IT COMES TO HOME INVASIONS, THAT'S WHAT THE SECOND AMENDMENT IS FOR. I DON'T THINK THERE ARE ANY LAWS IN THE BOOKS TO PREVENT LEGAL OWNERSHIP OF A GUN FOR THIS PURPOSE, DO YOU? THERE HAVE BEEN LESS AND LESS GUN CONTROL NATIONWIDE FOR THE PAST DECADE OR SO. First and foremost, you know full well the power any lobbyist has over our government, right wrong or indifferent! As for my solution? First, as a Christian, I KNOW what the answer is but folks want God out of the public square! How would I get rid of gun violence? the answer is I can't, you can't and the government can't!! When folks have it in their heart to be evil, there is not one human formulated law that will change anything! Not one! We have laws against drunken driving, right? How well is that working? How we gotten rid of drunken driving? NO! Why? Somebody is intent on driving drunk! As far as NOLA, no I don't think legal owners were the only target, I do know they were the EASIEST target because the cops ALREADY had names and addresses! As far as assault weapons, whether acceptable or not, they are LEGAL! My MAD example is not a solution, it is an example! My other example is an example and also not a solution! Everybody wants the senseless killings to stop. Until people start respecting other people to include those that are developing in the womb, it ain't gonna happen! Human law cannot do it God's laws can! Let me answer your question before you ask it. What's up with the abortion reference? Answer, the methods may be different but the results, loss of a human life is the same! One is called ILLEGAL yet the other is called LEGAL! You asked me so I told you! we may not agree but there it is! PS. How much of that disarmament is unilateral? AS A CHRISTIAN, IF YOU REALLY THINK THERE ARE PEOPLE WHO WILL DO EVIL NO MATTER WHAT, DON'T YOU THINK THE GOOD PEOPLE SHOULD DO EVERYTHING IN THEIR POWER NOT TO GIVE THEM DESTRUCTIVE POWER? THIS IS WHAT HAPPENS WHEN GOOD PEOPLE DON'T DO ENOUGH. INSTEAD, PEOPLE ARE MORE WORRIED ABOUT BEING INCONVENIENCED BY THE LAW. IT'S BECOME RATHER TRAGIC. Good people are trying to do something about it. Even God does not take away the ability for people to make a choice whether good or evil. Again, if somebody passed a law to make all weapons illegal, drug dealers, pimps, gang bangers, and murders will STILL be able to get them! That is the point! Those who care nothing for the law will skirt the law. look at my drunk driving example again! i appreciate being able to have a grown up conversation about this. I can see you are fully passionate about this subject. You want the violence to end, so do I. The question is how do we make that happen!